At the end of 2012, a group of fishermen captured in Mar del Plata the shark biggest of which have record in kayak fishing. Watch photos and video. Image gallery. Years ago with a group of friends we practice fishing kayaking off the coast of Mar del Plata. And from the beginning always Rondo us achieve a “super catch” some shark bacot, knowing that it would be an extreme event, taking into account the dimensions of the kayaks. As we are passionate about fishing and hungry for glory, we got firm with the idea of achieving that great goal. Unlike other species, the bacot is a very powerful and strong fish. We knew that the biggest problem that we face in case of getting a screenshot, would be in the first 10 minutes of fight: during this period they concentrate all your power and to feel the prick of the hook are transformed into real hard to stop missiles. There were many issues to resolve, several days of planning and study, even turned the key councils of David Dau, a specialist in the field. It only remained to put the place and insert our prows toward the ultimate goal. The sector chosen to develop this extreme fishing was la restinga National Park of Punta Mogotes lighthouse in the city of Mar del Plata. This unique and excellent fishing spot is characterized as part of the continuation of the Rocky massif of Tandilia chain, i.e., an outgoing high rock just about 50 cm above the sea level, in the form of island where you can observe with the naked eye the clash of big waves mentioned lift product. This sector is located 600 meters from the coast and its depth average 6 meters. Then there are two more located shoals between 2,000 and 3,000 m from the coast. The fascinating thing of this fishing is the presence of numerous and varied species housed in the recesses of the rocks, purple ideal for patrolling the large sharks in search of their food. In March 2012, we had already a screenshot of a bacot who was around 70 kilos. And we decided to go for more. Thus arrived last December to open the shark fishing season, when the water begins to be annealed and the species begins to be activated. We gather several friends, including fishermen from Pinamar to try once again to this exciting fishing from a kayak. The chosen area would again be in immediate vicinity to the first restinga’s Lighthouse. With everything ready, we embarked on a day of warm, calm seas and gentle wind of this sector. The modality that we be would be afloat, with a balloon in order to derive the rig to the desired position. Located in the area, we began to live an unforgettable day. In the first shot Leonardo Abalos enjoys a led “of those”, which fails to make cut the nylon of the reel. Minutes later, my cane gives a violent run that detonates the knot of the whip. To declare as early sprints, we knew that we were in the presence of a good school of sharks under our small boats. It took less than 15 minutes and in the shank of Fabián Mateos an infernal onslaught to the squid leaves it virtually without reservation of nylon, noting his balloon away quickly. Leonardo, in a quick move, then manages to rise anchor to attend his friend and let that animal dragged them, thereby avoiding a safe cutting line. In a matter of minutes, the two together kayaks were derived southwesterly 400 metres. By the way in which they were towed, we suspected that they would be something very important-sized. Mateos arms were exhausted. You decide to spend the shank to Leonardo, along with another fellow that made him “stamina”. The problem arose when the shark ran to the side of the sandbar. Luckily, the animal was already somewhat exhausted, so we were able to stop it. But not so: suddenly, the formidable bacot exploded in the air showing off his body in an amazing jump. All were paralyzed, because there they realized that it was a monstrous animal. Even at some moment they thought cutting the line and hit the turn. 1,500 metres from the starting point the shark began to lay down their forces. Then they approach it laterally to one of the kayaks, noting its majestic silhouette across the crystal clear waters. It was a wonderful specimen of shark bacot, which judging by its size would be around 100 kilos. A new screenshot for its size. Great excitement and caution produced approach face to the epilogue of the feat and they would have before making what would be the most difficult maneuver: removal of the hook stuck on the edge of his dangerous and challenging jaw. It is more complicated now, where you should take extra care. 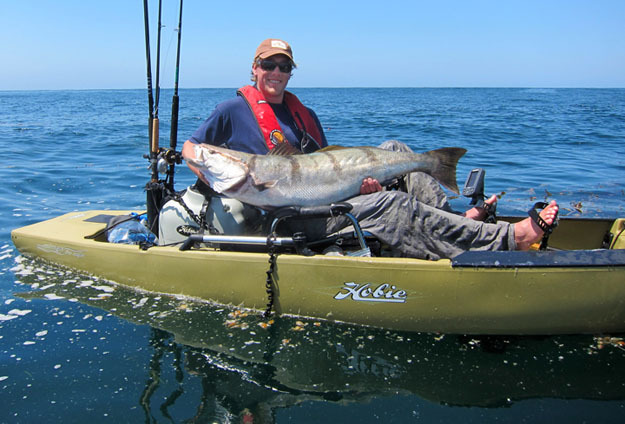 We know that a bite can cause a serious problem, and on a kayak should coordinate all movements and be very cautious to reduce any risk. They managed to immobilize it and, thanks to a certain maneuver and using a specific tool, they were able to extract from him the hook carefully, to be then immediately released to their habitat. The day was memorable. We estimate that we had about 12 shafts in total, but only a screenshot was capitalized in the shank of the friend Fabián Mateos, although it earned for all losses. Not afraid to be wrong, I think that a new record for the kayak fishing in our country and perhaps in the world, beat if we refer to this species in particular. It remains for us to indicate that this type of fishing must be carried out by skilled fishermen and many hours on a kayak, build a team of at least three members, being very important planning up to the smallest detail, since we consider it a high risk activity. Finally, I would remind you that the shark is mandatory release given that they are in danger of extinction. They are very important animals for the marine ecosystem. Years ago the great biologist Jauques Custeau mentioned it: “Without them, the health of the sea and, therefore, our lives will run danger”.